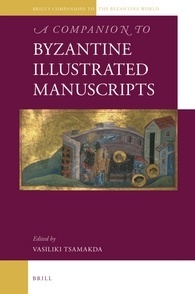 This volume offers an overview of Byzantine manuscript illustration, a central branch of Byzantine art and culture. Just like written texts, illustrations bear witness to Byzantine material culture, imperial ideology and religious beliefs, as well as to the development and spread of Byzantine art. 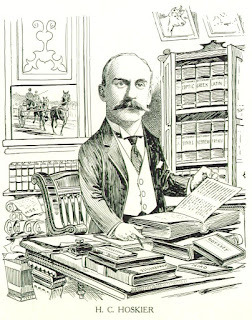 In this sense illustrated books reflect the society that produced and used them. Being portable, they could serve as diplomatic gifts or could be acquired by foreigners. In such cases they became “emissaries” of Byzantine art and culture in Western Europe and the Arabic world. The volume provides for the first time a comprehensive overview of the material, divided by text categories, including both secular and religious manuscripts, and analyses which texts were illustrated in Byzantium, and how. Contributors are Justine M. Andrews, Leslie Brubaker, Annemarie W. Carr, Elina Dobrynina, Maria Evangelatou, Maria Laura Tomea Gavazzoli, Markos Giannoulis, Cecily Hennessy, Ioli Kalavrezou, Maja Kominko, Sofia Kotzabassi, Stavros Lazaris, Kallirroe Linardou, Vasileios Marinis, Kathleen Maxwell, Georgi R. Parpulov, Nancy P. Ševčenko, Jean-Michel Spieser, Mika Takiguchi, Courtney Tomaselli, Marina Toumpouri, Nicolette S. Trahoulia, Vasiliki Tsamakda, and Elisabeth Yota. Every now and then I see the claim that the two dots that appear in the margin of Vaticanus indicate textual variants known by the original group of scribes. I believe that our own Peter Head agrees that they may indicate knowledge of textual variation at these points, but also that these marginal dots are very late. I am not sure if the following is on his list of examples but it may be instructive. Here we have the two dots under a correction which projects into the margin. The passage is Lk 18:19 and the variant concerns the presence / absence of the article before θεος. The original (archetypal/initial/autographic – take your pick) hand omits the article, which is then added by the second corrector. Rather unusually, two dots are placed under the omicron, closer together than the normal marginal dots (there are two sets on this page, 1337, col. 1), but apparently intended to match the size of the letter in question. 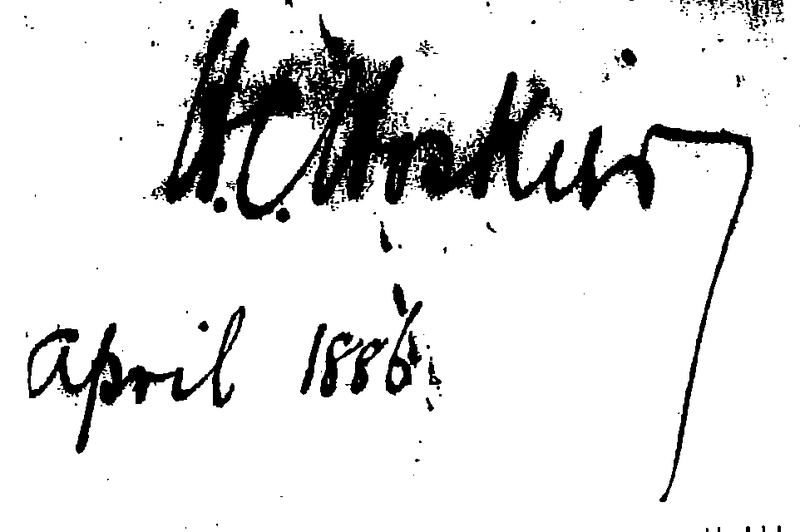 This suggests to me that at least these dots are 1) indeed connected with noting textual variation, 2) are by necessity added after the work of the second corrector. Add to this that the use of two dots to mark textual variation is rare in the tradition as a whole but is used elsewhere in Vaticanus, it follows that also those other marginal dots are post second corrector. Of course, the textual variants thus indicated might well be known to the original group of scribes, but the dots are an incorrect way of proving that. I don’t think I can attach photos or the like in reply segments, but you perhaps might want to post these in the main section on Hoskier (or start another post entirely). 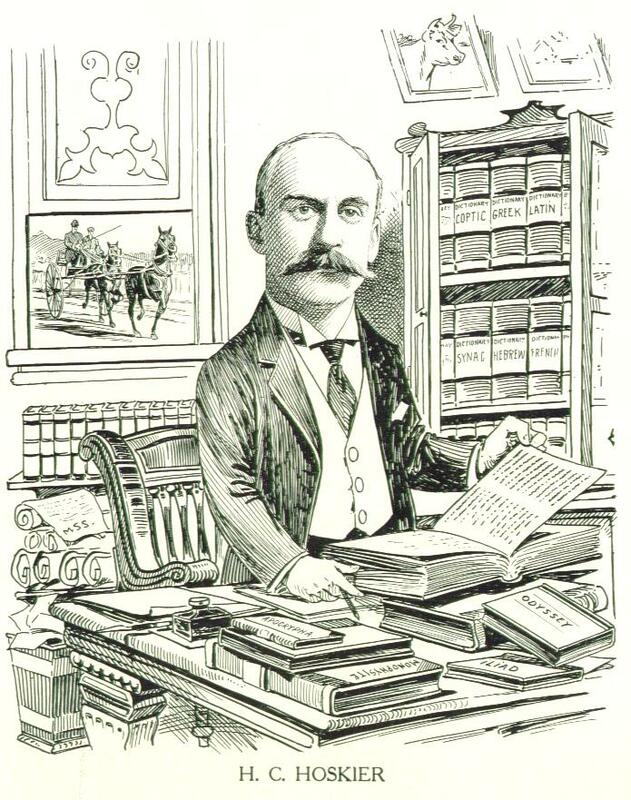 The caricature of Hoskier comes from a very rare limited edition book honoring various persons in and around South Orange NJ. I happened to stumble across that on eBay, and since the fellow could not sell the entire book, he ended up willing to sell the caricatures individually. 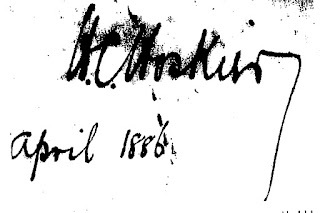 The signature came from Hoskier’s copy of one of Tischendorf’s Monumenta Sacra Inedita that Kenneth Clark had obtained (now in the Duke Divinity School library). The other photo was sent to me by someone... from somewhere. Also for trivia buffs: Hoskier is buried on one of the Channel Islands between England and France. I meant to post about this when it was announced but forgot in the mix of other responsibilities. 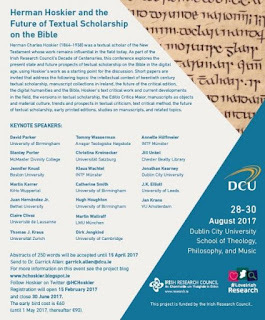 This looks like an outstanding lineup of speakers and I understand that a conference volume is expected. Paper proposals are open until 15 April. More info and registration here. 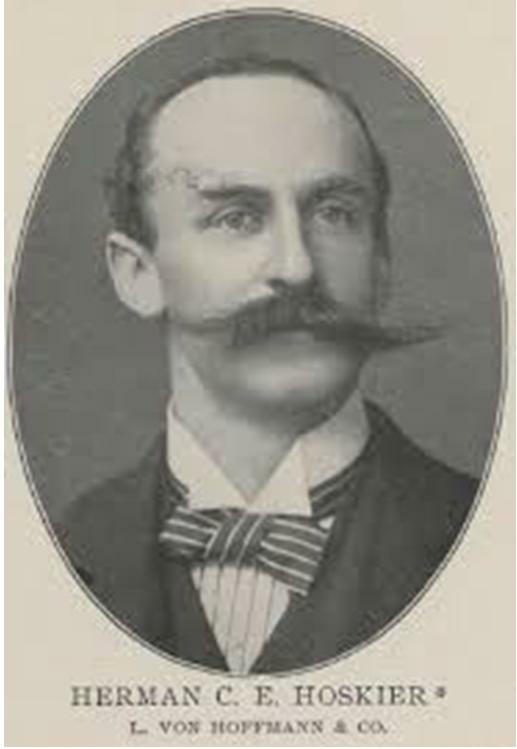 Herman Charles Hoskier (1864-1938) was a textual scholar of the New Testament whose work remains influential in the field today. 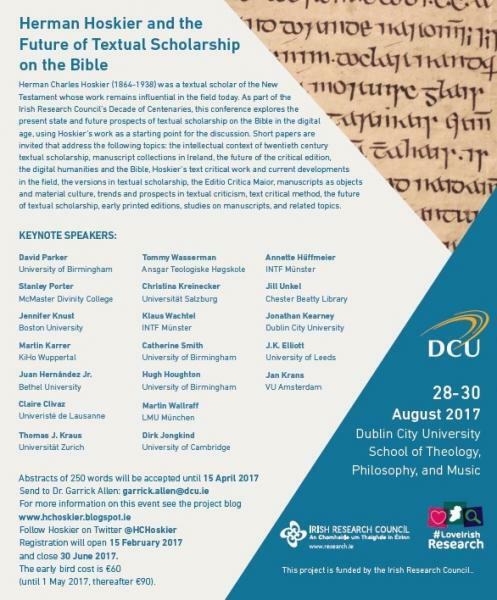 As part of the Irish Research Council’s Decade of Centenaries, this conference explores the present state and future prospects of textual scholarship on the Bible in the digital age, using Hoskier’s work as a starting point for the discussion. Short papers are invited that address the following topics: the intellectual context of twentieth century textual scholarship, manuscript collections in Ireland, the future of the critical edition, the digital humanities and the Bible, Hoskier’s text critical work and current developments in the field, the versions in textual scholarship, the Editio Critica Maior, manuscripts as objects and material culture, trends and prospects in textual criticism, text critical method, the future of textual scholarship, early printed editions, studies on manuscripts, and related topics. Hope everyone’s having fun at the Birmingham Colloquium this week. From Hugh Houghton’s tweets, it looks like a great turnout this year. Wish I could be there. Also, can somebody help Elijah Hixson find his pen? If you never had a look at P73, one of the Bodmer papyri, I cannot blame you. Dated to the 7th century, and said to contain ‘text’ from Mt 25:43 and 26:2-3. In all only (traces of) 18 letters are visible according to the INTF transcription, which makes this short blog post a whopping 226 characters longer. This story (ܣܘܢܬܟܣܝܣ = σύνταξις) is not found in all manuscripts. But Abba Mar Paule found it in one of the Alexandrian manuscripts and translated it into Syriac as written here from the Gospel of John. 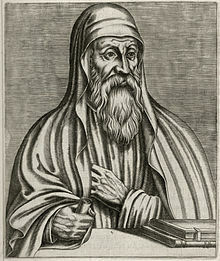 Paul of Tella, who was the leading spirit in the translation of the Hexaplaric O.T. by order of Athanasius I, and under whose auspices Thomas of Harkel laboured on the N.T. at the same time and the same place, viz. the Enaton-monastery near Alexandria (615-617), is, therefore, responsible for the introduction of John vii.53-viii.11 in MSS. of the Syriac N.T. This is interesting as it confirms the hypothesis that on Paul’s initiative the Harklean enterprise (whatever it has been: translation, revision, collation or mere annotating) was completed. And this is important as it adds probability to the surmise that Thomas’ work should be considered as analogous to the O.T. enterprise. For textual criticism e.g. the question, whether ‘Western’ copies could be present in the viith century in Alexandria and be still valued there by experts as authoritative, this point is very important. Now, we know that in most of the NT, Thomas actually used a nearly Byzantine text and in the Catholic Epistles he used something more distinctive, a possible precursor to the Byzantine text (so K. Wachtel). Where Thomas gave “Western” readings, so far as I understand it, is primarily in the margin in Acts. So I’m not convinced with Zwaan that this remark in Mingana Syr 480 shows that the “Western” text was valued in the 7th century in Alexandria. But it is still significant if Zwaan is right that this confirms Paul of Tella’s involvement in both the Syro-hexapla and the Harklean NT and that he is somehow responsible for the inclusion of the Pericope Adulterae in the latter. You can find this and more discussed in Chris Keith’s excellent book on the Pericope Adulterae. For more on the manuscript sources, see Gwynn. Marginal note in CCM 64, f. 79r, (17th cent.) explaining the origin of the Pericope Adulterae. 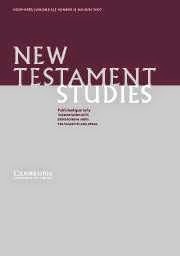 From the latest issue of New Testament Studies, three articles on topics of interest to ETC readers. At Luke 10.17, most modern critical editions incorrectly cite the wording of P45 as ἑβδομήκοντα δύο (72) instead of ἑβδομήκοντα (70). As this is one of the two oldest witnesses to the verse, this revision of external evidence calls for a fresh examination of the textual problem as a whole. Previous discussions have focused almost exclusively on the perceived symbolic values of ἑβδομήκοντα (+ δύο) to identify the ‘more Lukan’ wording, but this essay argues on the basis of new transcriptional evidence that the earlier reading is more likely ἑβδομήκοντα δύο. The owner of the Gospel of Jesus’ Wife provided Karen King with an interlinear translation of the text. Like the Coptic of the papyrus fragment, the English of this interlinear translation appears dependent on ‘Grondin’s Interlinear Coptic/English Translation of the Gospel of Thomas’. It shares a series of distinctive textual features with Grondin’s work and even appears to translate two Coptic words found in the Gospel of Thomas but not in the Gospel of Jesus’ Wife. Consequently, the Gospel of Jesus’ Wife seems undeniably to be a ‘patchwork’ of brief excerpts from the Gospel of Thomas created after November 2002. While the vast majority of manuscripts portray Jesus in Mark 1.41 as ‘moved to compassion’ (σπλαγχνισθείς) before healing a leper, five putative witnesses in three languages depict him ‘becoming angry’ (ὀργισθείς/iratus). 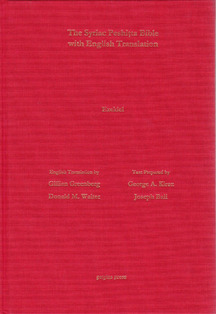 Following Hort’s dictum that ‘knowledge of documents should precede final judgments on readings’, this article offers the first thorough examination of the witnesses to ‘anger’, with the result that the sole putative Syriac witness is dismissed, the Old Latin witnesses are geographically isolated, and the sole Greek witness linked to the Old Latin as a Greek–Latin diglot. Since the final grounds for Jesus’ ‘anger’, that it is the lectio difficilior, also prove insubstantial, σπλαγχνισθείς is concluded to be original, with ‘anger’ originating in the Old Latin manuscript tradition. But then he goes on to discuss the theological cause of textual corruption. Now it must be said that the devil generally plots against living creatures and plans to divide the churches, to contrive heresies and schisms, and to produce countless stumbling blocks among men. It’s no surprise, then, that he also plots against the scriptures. Since our salvation is through them, he contrives to introduce discrepancies among them, so that through these discrepancies readers might be scandalized. Which are we to heed, this one or that one? You know all that we have labored over for God and for his grace, in juxtaposing the Hebrew text and the other editions to ascertain the proper correction of these mistakes. He will also grant aid in all that we want to do about the rest. In RBL, Jerome Lund reviews Gillian Greenberg and Donald M. Walter, trans. Ezekiel according to the Syriac Peshitta Version with English Translation (Piscataway, NJ: Gorgias, 2015). Every researcher in Syriac Ezekiel will appreciate this fully vocalized text and translation. It is useful in learning Syriac and in understanding forms that might at first blush be allusive if left unvocalized. However, textual critics of the Hebrew Bible should not use this text independently of the Leiden edition. I would think the same could be applied to the other OT volumes as well. The best place for TC is the Leiden edition but the Antioch volumes can be helpful.